[by Ent Team] Park Jaebum meets Dok2. Park Jaebum and Dok2 will have a surprise release of their digital single ‘MOST HATED’ at 6pm today. 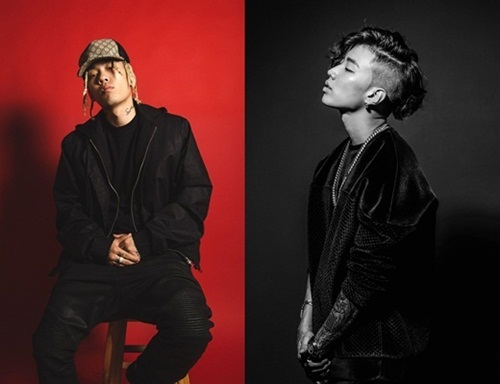 While fans and the public are already in anticipation after knowing the news that the two formed a producer team on the hip hop survival program ‘Show Me the Money 6’, on the 28th, both AOMG and ILLIONAIRE released the news and teaser image of ‘MOST HATED’ on their official SNS, raising anticipation. From the song ‘Doin’ Good (Remix)’ in 2010 up till ‘In My Whip’ released this past March, Park Jaebum and Dok2 have continuously been in tune with each other, as they have been responsible as the heads of AOMG, ILLIONAIRE, HIGHR MUSIC, AMBITION MUSIK, they resolutely put this song ‘MOST HATED’ together in order to improve themselves. In addition, trendy producer GroovyRoom was in charge or producing the track in which the combination of a strong beat and heavy rap is expected.